#1. This week's number one is former international forward Brock Motum (208-90, college: Washington St., currently plays in Turkey). He could not help Anadolu Efes (3-0) in their last game. Despite Motum's very good performance Anadolu Efes lost 86-96 at home to the lower-ranked (#7) Sakarya BSB. He was the second best scorer with 20 points. Motum also added 7 rebounds in 35 minutes on the court. The Regular Season already ended. Motum has individually a very good year with high stats. He averages: 19.3ppg, 7.3rpg, 2.0apg, 2FGP: 65.6%(21-32) and FT: 87.5% in three games he played so far. Motum played for the Australian senior national team two years ago. #2. Second place goes to former international forward Ben Simmons (208-96, college: LSU, currently plays in NBA). Simmons was not able to help the Philadelphia 76ers (3-3) in their last game. Despite his good performance the Philadelphia 76ers (3-3) lost 108-123 on their home court in Philadelphia to the Milwaukee Bucks. 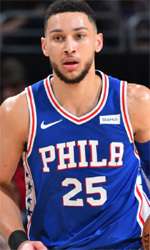 Simmons had a triple-double by scoring 14 points, grabbing 13 rebounds and passing 11 assists in 38 minutes; quite an impressive performance considering it's only his third season in pro basketball. But the season just started, so everything may happen. Simmons has very impressive stats this year: 12.8ppg, 10.6rpg, 7.4apg, 1.4spg, 2FGP: 41.7% and FT: 53.8% in five games. He played for the Australian national team in 2014. #3. The Australian player who performed third best last week abroad was former U22 international power forward Mangok Mathiang (208-92, college: Louisville, currently plays in Italy). Mathiang contributed to an easy victory against the closely-ranked Virtus Bologna (2-2) 84-66 in the Italian Serie A in Sunday night's game. He recorded a double-double by scoring 10 points and getting 11 rebounds. Mathiang also added 2 blocks. Vanoli Basket Cremona (3-1) is placed sixth in the Serie A. But the season is still in it's first stage and everything can happen. It's Mathiang's first year with the team. His overall stats this season are: 7.8ppg, 8.5rpg, 2FGP: 51.7% and FT: 16.7%. Mathiang has a dual citizenship: Australian and South Sudanese. He played for the Australian U22 national team three years ago. #4. Small forward Joe Ingles (203-87, currently plays in NBA) led Utah Jazz to a victory against the Dallas Mavericks (2-4) 113-104 in the NBA on Sunday night. He recorded 12 points, 7 rebounds and 5 assists. The Utah Jazz has a solid 4-2 record this season. It was his team's third consecutive victory in a row. Ingles is one of the most experienced players in a team as it's his fifth year in Utah Jazz's roster. This season Ingles has very high stats. He averages: 15.2ppg, 4.6rpg, 4.0apg and 2.0spg. Ingles used to play for the Australian national team back in 2016. #5. Former international swingman Ben Madgen (193-85, college: Augusta, currently plays in Germany) was not able to secure a victory for Crailsheim Merlins (1-4) in their game against BG Goettingen (4-1) in the German BBL. 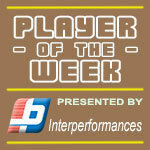 Despite his very good performance last Sunday Madgen was the top scorer with 20 points. He also added 5 rebounds and dished 6 assists. This season Madgen has very high stats. He averages: 19.6ppg, 4.4rpg and 2.8apg. Madgen used to play for the Australian national team four years ago. #6. Forward Duop Reath (211-96, college: LSU, currently plays in ABA League) couldn't help FMP (2-3) in their game against Crvena Zvezda (5-0) in the ABA League. Despite his very good performance in Saturday night's game He was the second best scorer with 15 points. Reath also added 8 rebounds and made 2 blocks. Reath's overall stats this season are: 8.8ppg, 5.8rpg and 2.0bpg. He is university international player as he played for the Australian team one years ago. #7. Former international point guard Patrick Mills (183-88, college: St.Mary's, CA, currently plays in NBA) contributed to a 1-point San Antonio Spurs' victory against the Los Angeles Lakers (2-4) 143-142 in the NBA last Monday. Mills recorded 12 points and added 3 assists in 31 minutes. The San Antonio Spurs have 3-2 record this season. Mills has been at the team for seven years. He has relatively good stats this year: 7.4ppg, 2.8rpg and 1.2apg in five games. Mills used to play for the Australian national team two years ago. #8. Swingman Xavier Cooks (203-95, college: Winthrop, currently plays in FIBA Europe Cup) couldn't help one of league's weakest teams s Oliver Baskets (1-1) in their game against Sakarya BSB (1-1) in the FIBA Europe Cup. Despite his very good performance on Wednesday night He was the top scorer with 18 points. Cooks also added 3 passes. There are only four games left until the end of the FIBA Europe Cup Regular Season. So now every game will be critical. It's Cooks' first season with the team. This year he has relatively solid stats: 14.0ppg, 4.0rpg and 2.0apg. Cooks used to play for the Australian university national team last year. #9. Former international point guard Dante Exum (198-95, currently plays in NBA) is a teammate of previously mentioned Joe Ingles. But that was another game of his team in NBA which we would like to mention. Exum contributed to an easy victory against the New Orleans Pelicans (4-1) crushing them 132-111. He scored 11 points in a mere 18 minutes. The Utah Jazz has a solid 4-2 record this season. It was his team's third consecutive victory in a row. Exum plays fifth season for the team. Exum has reliable stats this year: 10.0ppg, 1.8rpg and 1.6apg in five games. He used to play for the Australian national team two years ago. #10. Forward Thon Maker (216-97, currently plays in NBA) contributed to an easy victory against the Minnesota Timberwolves (2-4) crushing them 125-95 in the NBA last Friday. Maker scored 8 points and grabbed 4 rebounds. The Milwaukee Bucks have a very good 6-0 record this season. So far his team won all six games in the Regular Season. Maker's overall stats this season are: 4.0ppg and 3.5rpg. He is an international player who is currently on the senior Australian National Team roster. #11. Former U19 international guard William McDowell-White (196-98, college: Fresno St., currently plays in Basketball Champions League) couldn't help Brose Baskets in their game against AEK in the Basketball Champions League. McDowell-White cannot count Wednesday's game as one of the best ones. He scored only 3 points in 4 minutes on the court. His team lost 86-93. This year McDowell-White's overall stats are: 1.5ppg and 1.5rpg in two games. He used to play for the Australian U19 national team three years ago. #12. International guard Matthew Dellavedova (193-90, college: St.Mary's, CA, currently plays in NBA) is a teammate of previously mentioned Thon Maker and both played together in the last NBA game. Dellavedova contributed to an easy victory against the Minnesota Timberwolves crushing them 125-95. He scored 6 points and added 3 assists. Dellavedova's total stats this season are: 3.0ppg and 1.3apg. He is also in the roster of the Australian national team. #13. Former international point guard Joshua Wilcher (178-91, college: Cent.Wyoming, currently plays in United Kingdom) couldn't help Plymouth Raiders in their game against Newcastle Eagles in the British BBL. Despite his very good performance on Sunday night Wilcher was the second best scorer with 14 points. He also added 8 assists and 3 steals. Wilcher averaged so far 14.5ppg, 3.3rpg, 5.5apg and 1.2spg. He used to play for the Australian national team nine years ago. #14. Former U19 international center Matur Maker (208-98, currently plays in Switzerland) contributed to Neuchatel's victory against the seventh-ranked Massagno 73-60 in the Swiss SBL last Sunday. Maker recorded 10 points. Maker's total stats this season are: 5.8ppg and 3.8rpg. He used to play for the Australian U19 national team back in 2016. #15. Former U18 international forward Marko Deric (206-87, college: Loyola Mary, currently plays in ABA League) managed to help KK Dynamic Vip Pay Beograd in a victory against the eighth-ranked Rogaska 91-74 in the KLS on Wednesday night. Deric scored only 3 points in 7 minutes on the court. This year Deric's total stats are: 5.8ppg and 3.8rpg in four games. He used to play for the Australian U18 national team thirteen years ago. #1. Kyrie Irving (190-G-92, college: Duke, currently plays in NBA) could not help the Boston Celtics (4-2) in their last game on Monday. Despite his very good performance the Boston Celtics (4-2) were edged 93-90 on the road by the Orlando Magic. Irving was the top scorer with 22 points. He also added 8 rebounds and 5 assists. But this is still an early stage of the season and everything may happen. Irving has individually a very good year with high stats. He averages: 14.0ppg, 4.8rpg and 5.5apg. Irving is a naturalized American. Strangely he has never played in Australia. #2. Dominic Gilbert (198-G/F-96, college: UBC, currently plays in ABA League) was the major contributor in Cibona's victory against the closely-ranked Cedevita (2-3) 78-75 in a derby game in the ABA League last Sunday. Gilbert had a double-double by scoring 10 points and getting the same number of rebounds in 24 minutes. KK Cibona VIP Zagreb (2-3) is placed eighth in the ABA League. But there are still lots of games to play and it's a long way to go. This year Gilbert's overall stats are: 7.0ppg and 3.2rpg in five games he played so far. #3. Josh Duinker (209-F/C-89, college: Richmond, currently plays in Japan) was not able to help Kumamoto Volters (8-3) in their last game. Despite his very good performance the second-placed Kumamoto Volters (8-3) lost 85-98 in Aomori to the lower-ranked (#6) Watts in the West group. Duinker was the second best scorer with 20 points. He also added 6 rebounds in 29 minutes. It was Kumamoto Volters' first loss after five consecutive victories. Duinker has very impressive stats this year: 16.6ppg, 10.9rpg and 2.0apg in eight games. He has a dual citizenship: Dutch and Australian. #4. Jock Landale (211-C-95, college: St.Mary's, CA, currently plays in EuroCup) was not able to secure a victory for Partizan (1-3) in their last game. Despite his good performance the sixth-placed Partizan (1-3) lost 78-89 in Villeurbanne to the higher-ranked (#3) ASVEL Lyon- Basket in the group C of Eurocup. Landale was the top scorer with 12 points. He also added 6 rebounds and 3 assists in 24 minutes. It's Landale's first season with the team. Landale has relatively good stats this year: 10.8ppg, 6.3rpg and 2.0apg in four games. #5. Adam Thosby (198-G/F-91, agency: Players Group, college: Georgia SW, currently plays in United Kingdom) couldn't help Worcester Wolves (1-6) in their game against Scorchers (2-5) in the British BBL, despite his very good performance last Sunday. He was the top scorer with 21 points. Thosby also added 5 rebounds in 32 minutes; not bad, considering it's only his third season in pro basketball. But the bottom-ranked Worcester Wolves lost 86-99 in Guildford to the higher-ranked (#9) Scorchers. It was Worcester Wolves' sixth consecutive loss in a row. Thosby's stats this year are: 14.6ppg, 3.6rpg and 2.1apg in seven games. He is another player who holds two passports: Australian and British. Worth to mention Thosby played also at Eurobasket Summer League, which helped him get the job in pro basketball. #6. Obi Kyei (206-F-94, agency: Two Points, college: Eckerd, currently plays in Spain) led Lleida Basquet to a victory against the closely-ranked Palencia Baloncesto 90-80 in the Spanish LEB Gold (second division) in Friday night's game. Kyei scored 14 points and had 3 steals in 21 minutes. 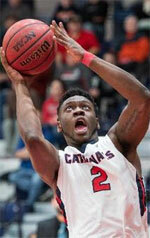 This year Kyei's total stats are: 9.6ppg and 3.6rpg in five games. He has both British and Australian nationalities. #7. Venkatesha Jois (202-F-93, college: E.Washington, currently plays in Germany) contributed to a SC Rasta Vechta's victory against one of league's weakest teams Braunschweig 87-79 in the German BBL in Sunday night's game. Jois scored 6 points. Jois has averaged so far 6.5ppg, 4.8rpg and 1.3spg. #8. Declan Soukup (190-G-94, college: Assumption, currently plays in United Kingdom) couldn't help Plymouth Raiders in their game against Newcastle Eagles in the British BBL. He recorded 9 points and added 4 passes in 23 minutes. His team was badly defeated by 18 points 103-85. Soukup has averaged so far 2.7ppg, 2.0rpg and 2.8apg in six games. #9. Timothy Kearney (201-F/G-86, currently plays in Sweden) helped BC Lulea win their game against the fifth-ranked Boras Basket 97-80 in the Swedish Basketligan on Sunday night. He scored 8 points, grabbed 4 rebounds and dished 3 assists. Kearney has averaged so far 5.0ppg, 2.7rpg and 1.6apg. He also holds two passports: Australian and Swedish. #10. Rasmus Bach (193-G, college: Fort Lewis, currently plays in Denmark) managed to help Randers Cimbria Basketball in a victory against the leader BMS Skovlunde 98-91 in the Danish BasketLigaen in Saturday night's game. Bach scored only 2 points, grabbed 4 rebounds and dished 3 assists in 28 minutes. Bach has averaged so far 7.2ppg, 2.8rpg, 3.6apg and 2.2spg in five games. He has dual citizenship: Australian and Danish.